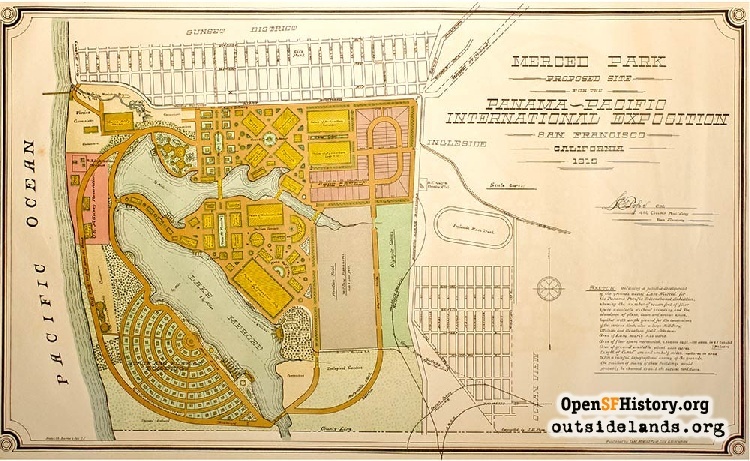 The plan to have the Panama-Pacific International Exposition of 1915 at Lake Merced. Map of Merced Park, proposed site for the Panama-Pacific International Exposition in 1915., 1915 - Designed by J. E. Pope, Civil Engineer. Courtesy of Ron Ross. 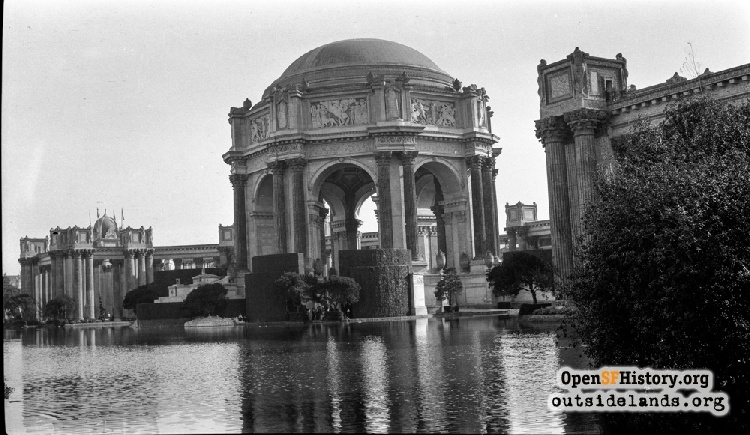 In 1915, San Francisco celebrated the centennial of the Panama-Pacific International Exposition (PPIE), the fair that remade a swampy area called Harbor View into a wonderland of exhibit halls, courts, plazas, technology showcases, a “Joy Zone,” and a Tower of Jewels centerpiece. All that remains of the PPIE in today’s Marina District (other than Marina Green) is Bernard Maybeck’s haunting Palace of Fine Arts, an imagined ancient ruin of domed temple and colonnade beside a tranquil lagoon. With full-figured reliefs of mournful “weeping women” atop ochre columns, the whole landscape is a Maxfield Parrish painting come to life. Built to resemble something from antiquity, the Palace feels eternal, like it has always been where it is, but if west side boosters had had their way, the fair, with its dazzling attractions and architecture, could have been on the shores of Lake Merced. After San Francisco beat out New Orleans and won a Congressional vote to host the 1915 Exposition, organizers faced an intra-city battle on where to put it. The San Francisco Chronicle described the problem on March 5, 1911: “There is hardly a section of San Francisco that has not many to do it reverence in asserting it to be the logical and only defensible place in which the exposition should be established.” Harbor View, Lake Merced, Golden Gate Park, the waterfront around the Ferry Building and the Bay View District all had supporters. In making a decision, the fair’s Board of Directors had to weigh land title issues, weather, topography and natural beauty, as well as the political clout of boosters. Our friend Ron Ross has been kind enough to share a proposed site plan prepared by the Lake Merced Fair Site Association. 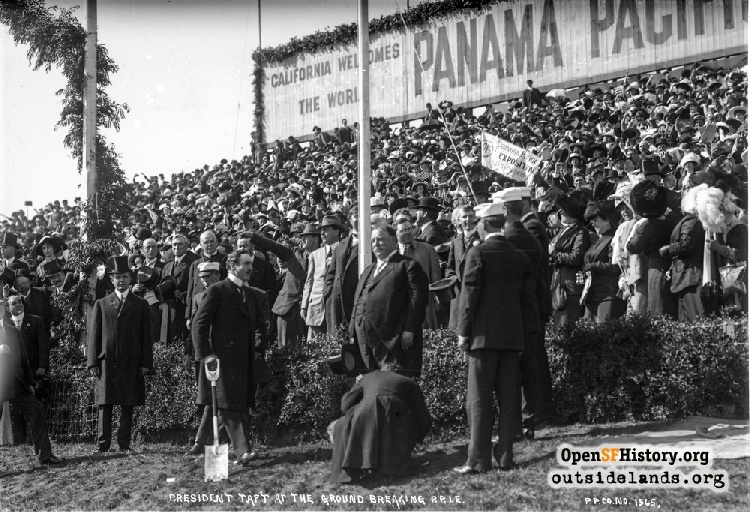 The creation and opening of the Panama Canal was a primary inspiration for the fair, and engineer J. E. Pope’s plan for “Merced Park” has a number of references to the ocean-connecting waterway. The exposition’s midway in the upper right is nicknamed “The Canal,” and where the San Francisco Zoo would eventually reside, a Venetian-themed zone features a Panama Canal in miniature. Grand courts, plazas, and fountains are situated where the Merced Manor and Lakeshore developments would be built south of Sloat Boulevard. One wonders if the proposed “Tropical Orchard” in the southwest corner of the plan may have struggled with the area’s fog. 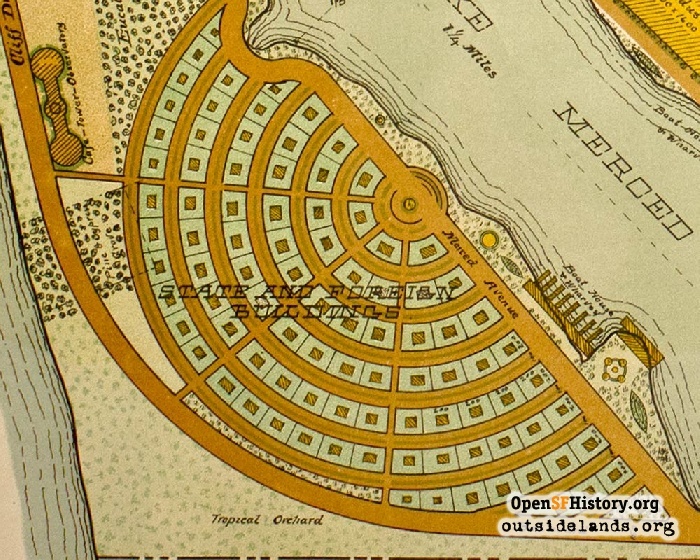 Detail of map of Merced Park, proposed site for the Panama-Pacific International Exposition in 1915. , 1915 - Designed by J. E. Pope, Civil Engineer. Courtesy of Ron Ross. 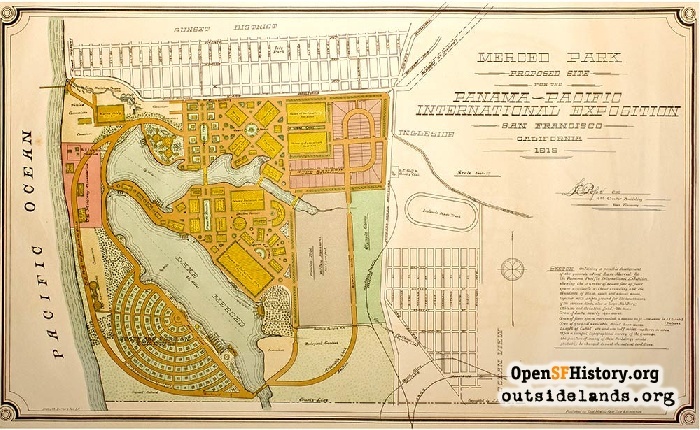 By the time President Taft came out to perform the groundbreaking in October 1911, a “whole city” compromise had been reached, spreading the fair from Telegraph Hill to Golden Gate Park, but excluding Lake Merced. (In the end, the “whole city” ended up only being the Marina.) So, when the president pushed his spade into the sandy loam of Golden Gate Park’s Polo Fields he might as well have been digging the grave of the Merced Park Fair. Why didn’t Lake Merced win? Grading and landscaping on such a large site would have been costly. Transportation was a key factor as well. Thousands visit world fairs, but most are local, and at the time, few lived near Lake Merced. Getting everyone out to the southwest section of the city would have required the proposed Twin Peaks streetcar tunnel to be finished quickly. The tunnel was a very expensive project and didn’t end up opening until 1918. If the PPIE had come to Lake Merced there is no surety we’d have something like Maybeck’s masterpiece still standing there, or that we’d have anything left at all. The fair architecture was meant to be temporary, and outside of the Palace of Fine Arts and Marina Green, the entire wonderful fair of 1915 has been replaced by apartment buildings, houses, and flats. Still, as it must have been for the Lake Merced boosters a hundred years ago, it’s fun to imagine the glorious fair around the lake that could have been. Polo Fields. President Taft at groundbreaking for PPIE. PP1565, 1911 - Pillsbury Picture Co. Page launched 18 September 2017.